The flathead catfish population in the Imperial Division backwaters appears to be doing well. 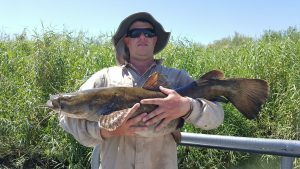 In May, the Arizona Game and Fish Department Yuma Region Aquatic Wildlife Program conducted an annual electrofishing trend survey targeting Flathead Catfish on the Imperial Division of the Colorado River. In 30 randomly selected survey stations, a total of 596 flathead catfish were collected, weighed and measured. Flathead catfish ranged in size from 3.3 in to 40.5 inches, with an average length of 14.1 inches. Weights ranged from .02 pounds to 30.6 pounds, with and average weight of 1.7 pounds. The number of fish caught per station in 2017 was about average when compared to the past five surveys, suggesting that the population is stable. The size structure of the population appears really healthy as well, with a good mix of small, medium and trophy-sized fish being present. A flathead catfish from the Imperial Division from 2008. 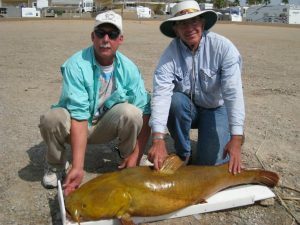 The largest flathead sampled during the survey was 40.5 inches and 30.6 pounds, though many fish more than 60 pounds have been captured in the past, including one monster of 89 pounds! (above). Water temps are in the low 70s and more reports of good fishing are coming in, so get out there start fishing for some true river monsters! The Imperial Division of the Colorado River is a 38-mile stretch extending from Imperial Dam, upstream to Cibola Lake. Imperial Dam was completed in 1938 for the purpose of diverting water for irrigation. The upper 28 miles falls within the boundaries of the Cibola and Imperial National Wildlife Refuges. The lower 10 miles are mostly on land managed by the Bureau of Land Management. Part of the shore on the California side across the river from the Imperial National Wildlife Refuge is managed by the State of California as the Picacho State Recreation. The Imperial Division of the Colorado River is different from the river upstream because it has not been highly channelized. This division includes numerous backwaters on both sides of the river channel. The total surface area of backwaters in this division is approximately 1,325 acres. Within the Imperial Division, backwaters greater than 20 acres comprise approximately 85 percent of the total backwater area. The banks of this division are lined with vegetation compared to upstream divisions that are mostly rip-rapped. Bank vegetation mostly includes phragmites , cattail, and bulrush. The special electrofishing settings used during these flathead catfish surveys do not immobilize other fish species so no other species of fish were captured. During these flathead surveys, the electrofishing boat slowly moved along the shoreline, continually emitting electricity. A chase boat was employed to capture all stunned fish beyond the reach of the netters on the electrofishing boat.